Following the junior doctors’ ballot on industrial action, we wanted to assure local people that we are working hard to make sure any disruption to services is kept to a minimum, wherever possible. 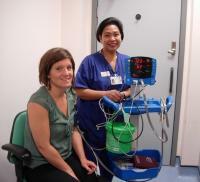 Young people participating in the National Citizen Service (NCS) programme have partnered with Epsom Medical Equipment Fund to raise money towards the purchase of a new vital signs monitor for the Day Case Unit at Epsom Hospital. Chief Executive Daniel Elkeles said: “Our hospitals recently underwent a thorough inspection from the independent regulator of health and adult social care in England, the Care Quality Commission (CQC), and although we will not have their report until spring of next year, the early feedback from the Head of Inspectors indicates that our staff and organisation have a lot to be proud of. Staff at Epsom and St Helier hospitals have been honoured with a special award in recognition of delivering excellent care and inspiring leadership. Chief Executive Daniel Elkeles, said: “Following the junior doctors’ ballot on industrial action, we wanted to assure local people that we are working hard to make sure any disruption to services is kept to a minimum, wherever possible.